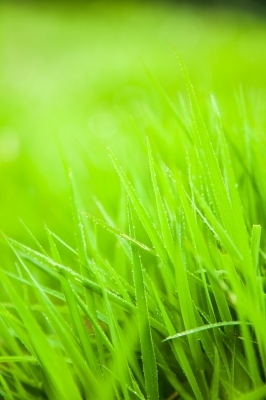 Organic Solutions provides Organic Lawn Care in CT, RI, and MA. Why Should You Use Organic Lawn Care? While people are often told that things we enjoy are somehow or other "bad for us," a well maintained lawn is one of life's pleasures that also happens to be a major boon to the environment. An organic maintained lawn, in particular, helps purify rainwater before it reaches wells and waterways. America's lawns generate oxygen, clean our air of dust, dirt pollution, they fight soil erosion, and help conserve energy by keeping our homes naturally cooler in the summer. Still there is a growing concern among many homeowners, about modern lawn care's reliance on toxic chemicals and the hazards they pose to children, families, wildlife, and drinking water. Chemical lawn treatments also attack not only pests, but also your lawn's natural helpers, like earthworms and ladybugs, making your lawn increasingly dependent on synthetic fertilizers and pesticides to stay looking healthy over time. Today, more and more people are opting for natural lawn care services, like those offered by Sutherland Organic Solutions (SOS) as the safe, responsible, common sense approach to lawn care. The base of the fertilizer used by Sutherland Organic Solutions is made from the composted poultry manure of "Grade A" egg laying hens (CaC03 “Plus” 100%Natural Calcium “Plus” Tera Vita SP-85 Soluble Humate). This natural fertilizer enriches and strengthens soil structure and helps to reduce erosion, without increasing the toxic load to our environment. Through aeration and seeding, Sutherland Organic Solutions introduces beneficial grasses to your lawn that are more drought, insect and disease resistant. SOS will help you detox your lawn from its dependence on synthetic fertilizers and chemical pesticides. We will work with nature to help establish and maintain a beautiful lawn, providing you with a landscape that is an integrated part of the wider ecosystem, and that won't depend on chemical applications year in and year out to stay looking green and healthy.